By the time our guide started handing out the gas masks, I was beginning to wonder whether I should be standing atop the Masaya volcano at all. Masaya is the only drive-up volcano in the Western Hemisphere. Located about 23 kilometres southeast of the capital city of Managua, Masaya is among the most active of Nicaragua’s 18 volcanic structures. Its craggy, rock-strewn bulk rises just 635 metres above sea level, but it contains five formidable craters – including the steaming, rotten-egg-smelling one I was leaning over. “Bloody big, isn’t it?” remarked the English fellow to my right, as we peered into the smoky, sulfurous depths in search of red-hot lava. Once it’s dark, we’re told, we’ll be able to see an orange glow emanating from the molten rock 400 metres below. Small wonder Nicaragua’s indigenous tribes were terrified of this place. During the pre-Columbian age, they believed Masaya’s eruptions were a sign of anger from the gods. “They used to sacrifice virgins to venerate the volcano,” explained Ludim Bermudez, a ranger at Masaya Volcano National Park. Well, at least I’m safe on that front. The Spanish conquerors of the 16th century weren’t much better. They were convinced the active volcano was “La Boca del Infierno” or “The Mouth of Hell.” A priest named Father Francisco Bobadillo even erected a cross at the crater’s edge in a bid to exorcise the devil. Today, a large metal replica of the Bobadillo Cross presides over a lookout at the top of a 177-step concrete stairway. As I huffed and puffed my way to the top through the occasional cloud of smoke, I was rewarded with spectacular views of the active crater and the sterile black lava fields surrounding it. Angry gods and the devil aside, there’s still good reason to fear Masaya. Bermudez related how in 2001, a tourist was injured and several vehicles in the visitors parking lot were damaged when the volcano exploded without warning, sending huge chunks of rock 500 metres from the crater. Suddenly those signs in the parking lot made perfect sense. And then there are the volcano’s gases – a noxious mix of sulfur dioxide, carbon monoxide and hydrochloric acid. The little vegetation that clings to the slopes in the direct path of the drifting smoke is stunted and dry. Gotcha. Pass the gas mask, please. Amazingly, though, there is life within the active crater. As twilight set in, a flock of green parakeets squawked past overhead and disappeared into the smoke wafting out of the crater. The birds have somehow adapted to the sulfur gases, and return each evening to nest within the crater’s walls. Despite Masaya’s ever-present danger – or perhaps because of it – the volcano has grown as a tourist attraction since being established in 1979 as Nicaragua’s first and largest national park. 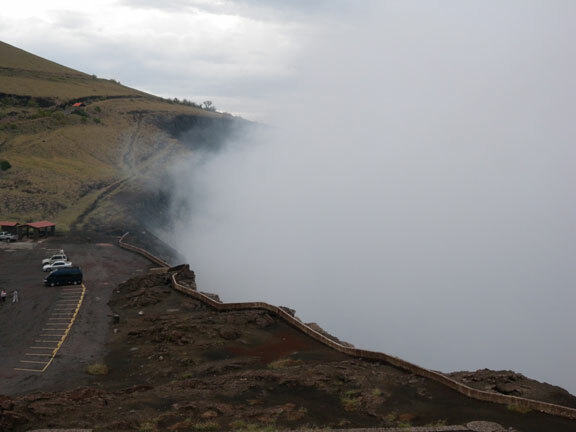 It’s the only volcano in the Western Hemisphere where you can drive right up to the rim, making it easily accessible to families with small children and travelers who are older or out of shape. Every year, more than 100,000 visitors pass through the gates of Masaya Volcano National Park, then drive or hike uphill along a five- kilometer paved road to the edge of the active crater. But the adventure doesn’t end there. The park also includes 20 kilometers of scenic hiking trails to other viewpoints and craters. As twilight deepened into night, we grabbed helmets and flashlights and set out on a rocky path that led to a 612-metre-long lava tube beneath the earth’s surface. The tunnel was formed between 800 and 1,000 years ago when rivers of lava forced their way out of the volcano. As we marveled at the rock formations inside (and flinched at the odd bat awakened by our lights), our guide described how indigenous people used to perform ceremonial rituals in the cave. Hundreds of years later, during the Sandinista revolution of the late 1970s, area farmers hid out in the cave. Even more fascinating, though, is the Tzinaconostoc cave a short walk away. It’s home to more than 20,000 bats – ten species in all. As we shone our lights through the mouth of the cavern, it seemed every one of the winged creatures was circling the roof en masse. Minutes later, the bats started flying out of the cave – just a few at a time, at first – then in great waves. I could feel them brushing past and braced for a head-on collision at any moment, but not a single sonar- guided critter strayed off course. By then, it was fully dark and I was ready for the big finale. 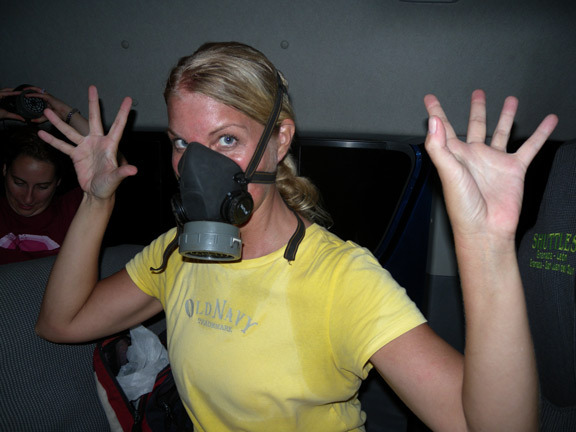 As we hiked back out, we traded our helmets for gas masks and prepared to peer into the Santiago crater once again. I have to admit, I was expecting more. As I gazed deep into Bobadillo’s Mouth of Hell, I saw just an orange glow softened by gauzy curtains of smoke. The fearsome fiery lava itself was hidden from view. I was no longer afraid. But I left Masaya with a new respect for the awesome power not far beneath my feet. And a sense of relief – that we had indeed parked our vehicle facing the exit. Cindy Burgess is a Toronto-based freelance writer. Her tour of Masaya Volcano National Park was subsidized by Tierra Tour. Hours: 9am – 5pm daily Entrance fee: $4 U.S.